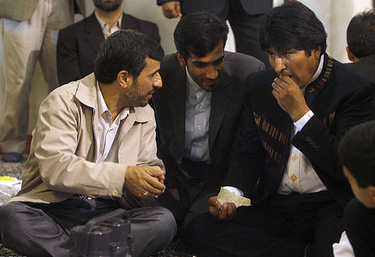 Iranian president Mahmoud Ahmadinejad (left) hosted an Iftar (fast breaking) ceremony on Ramadan in Tehran, September 3, 2009, which was attended by Bolivian president Evo Morales (right) during a two-day official visit. Tehran is now believed to be extracting uranium from as many as eleven different sites in Bolivia close to the country's industrial capital of Santa Cruz. Ilan Berman is vice president of the American Foreign Policy Council in Washington, D.C. This article is adapted from his February 16, 2012 testimony before the Senate Foreign Relations Committee's Subcommittee on Western Hemisphere, Peace Corps, and Global Narcotics Affairs. Related Topics: Iran | Ilan Berman | Summer 2012 MEQ receive the latest by email: subscribe to the free mef mailing list This text may be reposted or forwarded so long as it is presented as an integral whole with complete and accurate information provided about its author, date, place of publication, and original URL.